Group of 9 pcs assorted coin silver including Tennessee. 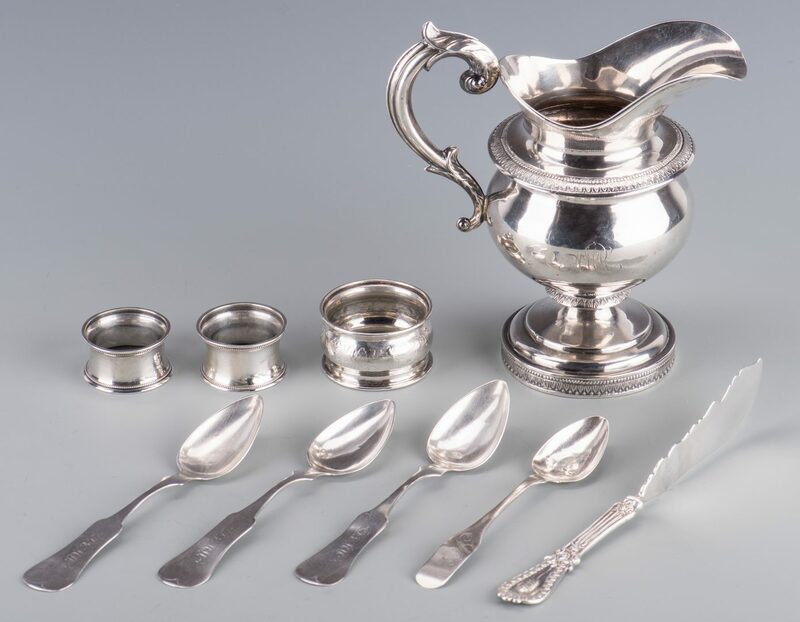 Includes 3 fiddle swell pattern teaspoons marked F.H. Clark & Co. in rectangles (Frederck Henry Clark, working Memphis 1850-1866), monogrammed DVMW; 1 master butter knife with Classical pattern handle with incuse marks for Wood and Hughes (New York) and retailer W.S. 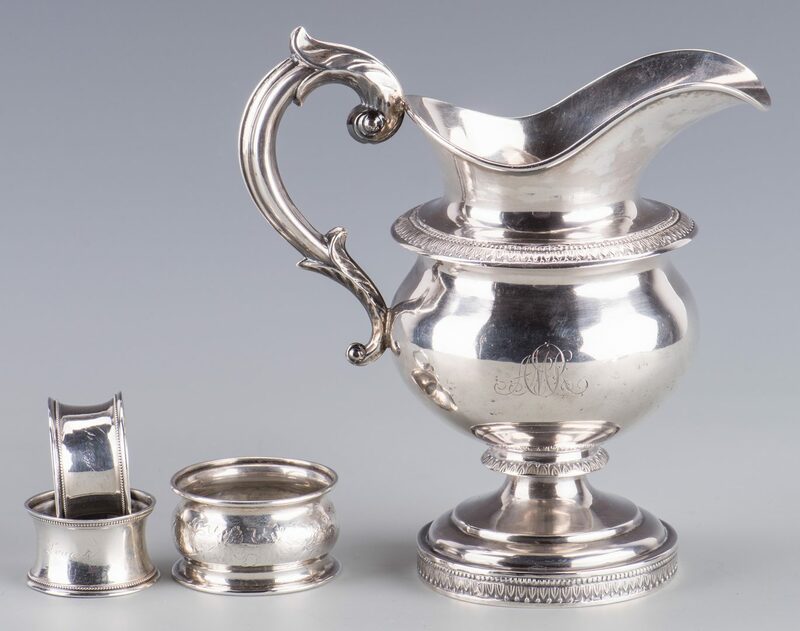 Byrd (Memphis, 1859-d. 1874), monogram MW; and 1 teaspoon with coffin end and maker's mark TT (possibly Thomas Thomson, working Williamson County, TN 1822-1830), monogram NG. 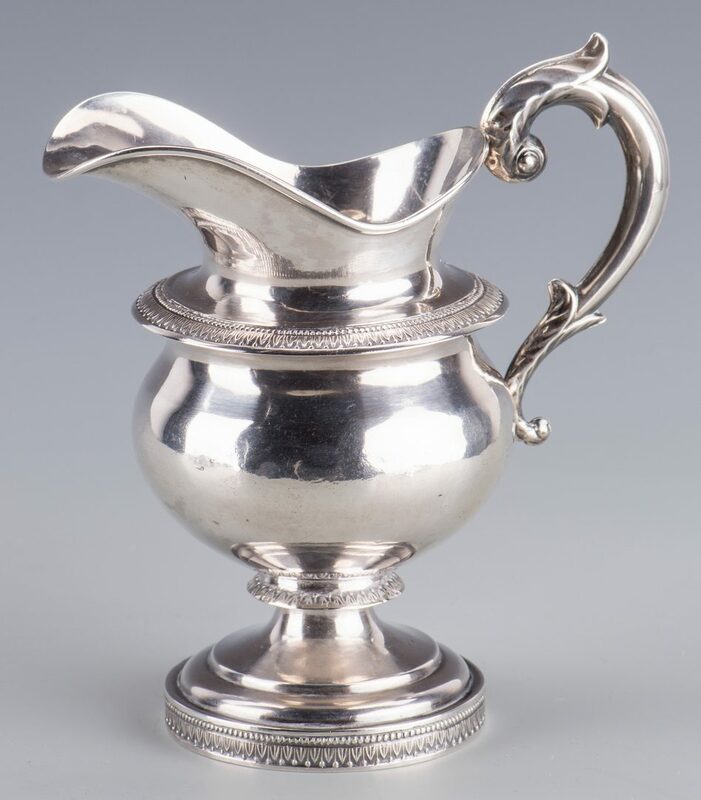 Also included is a coin silver cream pitcher, bulbous form with band of laurel decoration at top and base of body and on footring; marked R. & W. Wilson (Robert and William Wilson, working Philadelphia, c. 1825-1846) in rectangle and monogrammed AMR. 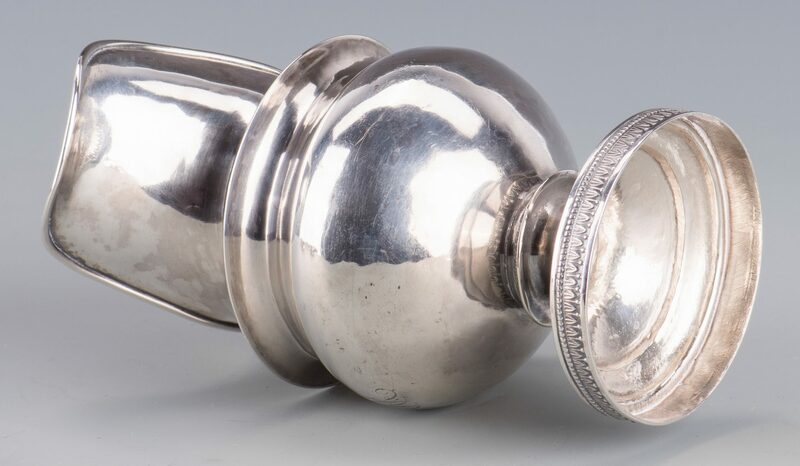 7" H; and 3 silver napkin rings, unmarked but believed to be coin silver, 2 with beaded edges monogrammed Mary (1) and Louisa (1), the other with bulbous body and chased floral decoration, monogrammed ALL, 1 1/2" to 2" diam. 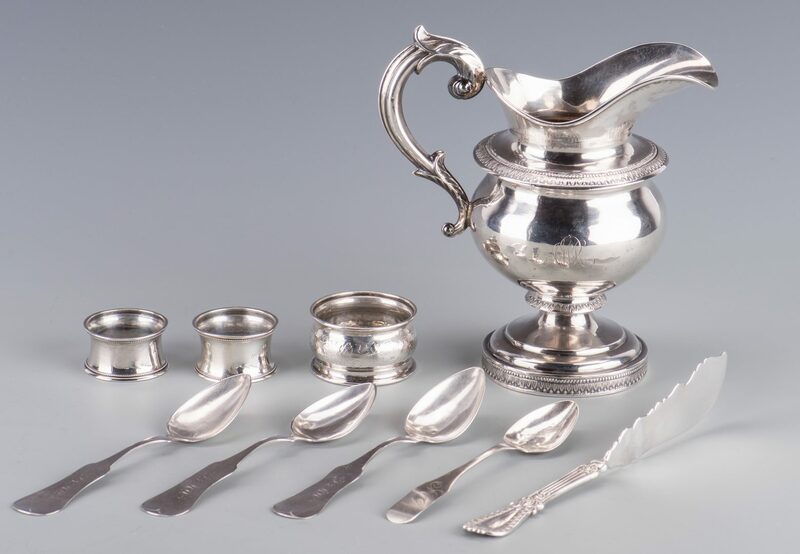 All items 2nd -3rd quarter 19th century. Combined weight: 13.14 oz troy. Provenance: The estate of Peter Fyfe, Nashville, TN. 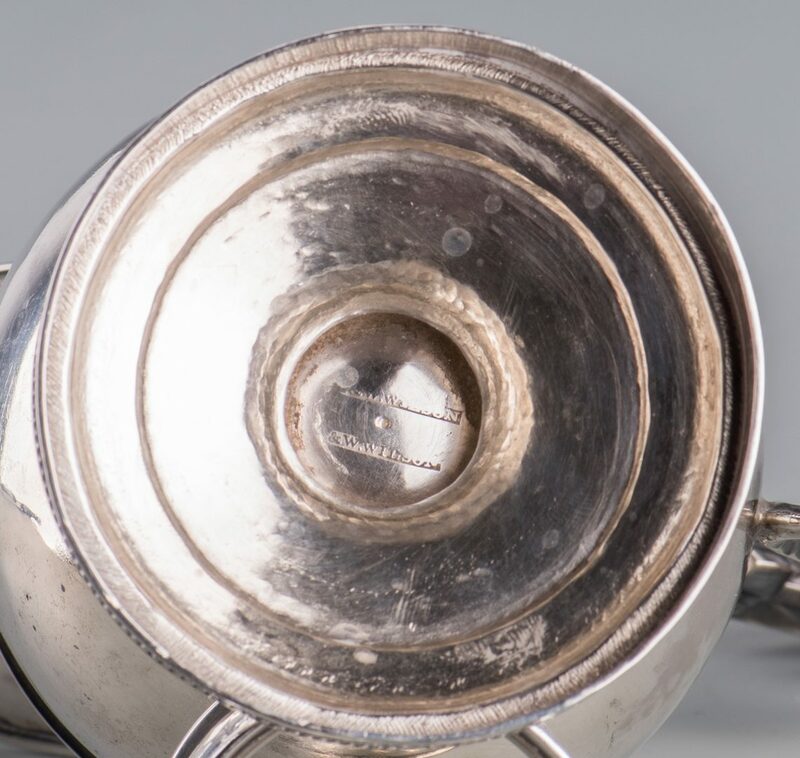 CONDITION: Small dents to bowl of spoon marked TT; wear to monograms and decorations on napkin rings and butter knife.